Browse a collection of Frequently Asked Questions. The more you learn and the more you prepare for your cruise and dialysis services aboard the ship, the more relaxing and enjoyable your vacation will be. Frequently Asked Questions are udated regularly and answer the most common questions we get from our travelers. Click here to browse the Frequently Asked Questions section. Be prepared for your next cruise with Dialysis at Sea Cruises by learning more about what medical records you need to bring with you. Propoer medical records are critical in making your dialysis treatment aboard successful. Here you'll find an itemized list of essential medical record you'll need to bring with you on vacation. Click here to find out what Medical Records you'll need to cruise. If you're new to cruising, this section is for you. 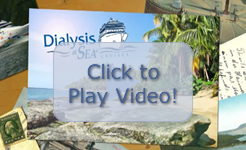 Click here learn more about what to expect when cruising with Dialysis at Sea Cruises. Going on vacation, leaving home, and esspecially when you leave the contry, proper documentation and proof of citizenship is critical. The "Documents" section is designed to help you recognize all the important considerations when traveling with Dialysis at Sea Cruises. Browse an itemized list of documentation requirements here. Click here to see what Documents you'll need. Need help finding the Port. The day of travel is no time to figure out where your heading. Dialysis at Sea Cruises sail from many different ports around the World. Here we provide address and contact information for all ports from which we sail. If you need additional information, please feel free to give us a call! Click here for Port information.